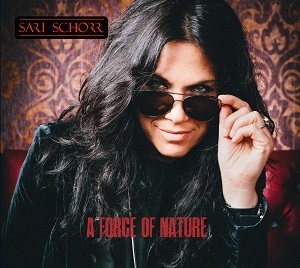 Sari Schorr is a blues-rock singer from New York who has been inducted into the New York Blues Hall of fame and has toured with Popa Chubby and Joe Louis Walker amongst others. Her producer, Mike Vernon was so impressed after seeing her perform that he came out of semi-retirement to produce her album, and after listening to the album it's clear what impressed him so much - she has a fantastic voice. The album kicks off with "Ain't got no money", a superb song that shows off just how powerful and impressive her voice is. It carries plenty of emotion as well as power, and it's clear from this song that she's got a good band behind her. "Black Betty" is a cover of the Lead Belly classic, famously covered by Ram Jam. Sari Schorr's version bears more resemblance to the Lead Belly original than to the Ram Jam cover, particularly for the first minute or so where it's very similar, but then the band kick in and she turns up the power on her vocals. It's an excellent cover. People used to the Ram Jam version might find this to be a bit slower paced than they're expecting so it might take a few listens to fully appreciate just how good it is. "Work no more" is a song written by Walter Trout, who also plays guitar on this song. It's a great song, but it's testament to the songwriting of Sari Schorr that this song doesn't stand out compared to the other songs - it shows that her songwriting is good enough for her songs to hold their own against well known Blues legends like Walter Trout. "Stop! In the name of love" was a big hit for The Supremes, and with a well known classic then doing a cover is always a risky move as the new version will be compared to the original. With this cover Sari Schorr has really succeeded in putting a totally different spin on it. Gone is the pop/soul sound and in comes a far more bluesy sound. Her voice sounds superb during the verses - powerful, emotional and slightly raw, and with the smooth backing vocals for the chorus contrasting nicely against her voice it's a fantastic result. The lyrics on this album are just as important and impressive as the vocals, and there's a real social commentary going on with songs about society's obsession with money (Aint got no money), Heroin (aunt Hazel), domestic violence (Damn the reason) being just the first three songs on the album. A superb album - highly recommended.